Rewind your tapes; think just a few years back, where mobile, cloud and social media were the top frontiers of the emerging technology landscapes. Now, they have become a way of business and changed how the world conducts its business. Every day, the technology innovations crop up with something new before the business being able to understand and integrate. The power has turned the vision from business to customers and now, the customers are the big boss. The radical speed of the technology advancements and changing customer’s needs let the businesses ask- what’s next? As the competition is getting ruthless, mapping the businesses technology blueprint with changing customer trends is of great importance to proactively answer the customer’s demands else businesses will lose the customers to the competitors. 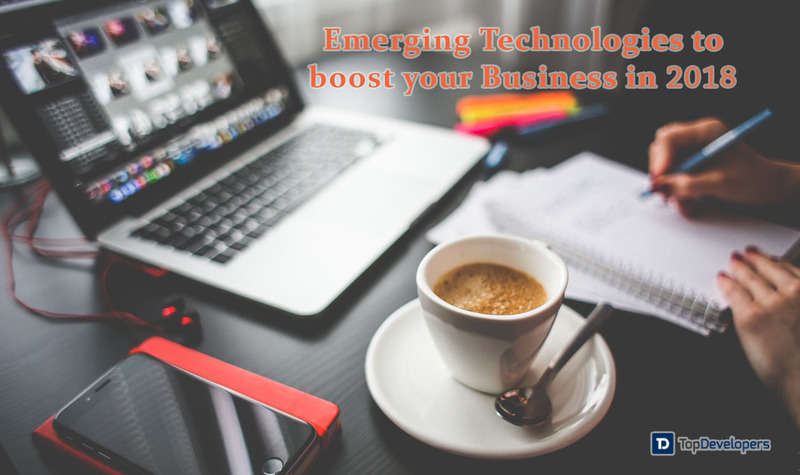 In 2018, it’s anticipated that businesses can’t afford to overlook the accelerating emerging technology trends and have to be on their toes because the technologies are expected to reach their peak and make the business future-ready. The technology change may be a threat or opportunity for your business, so now; it’s over to you how you take it, as positive transformation or negative transformation. AI coupled with machine learning and natural language processing (NLP) is the most disruptive class of technology because of its radical computational power that can understand the user behavior and patterns in milliseconds and discerning enough to solve the problems in an automated fashion. The technology definitely finds early adoption due to the precise results and assistance they provide to the human working environments. Varied industry verticals have started embracing the technology to benefit from advanced AI. The technology has great potential that has reinvented the reality of the physical world by superimposing the virtual objects over the physical environment. The immersive nature of AR is an excellent medium for different industry verticals to illustrate the content in the context and easy-to-understand form. Realizing the big potential and capabilities of the technology, the businesses have started embracing it. A fundamental shift is analyzed in the mass adoption and user experience when the technology is combined with social platforms like- Facebook, Instagram, Snapchat and more. It has extended the horizon of marketing and now, it’s not limited to the physical world. IoT bridge the gap between specialized sensors, actuators, networking and real-world objects through internet thereby turning the Sci-Fi into reality. Yes, the development of novel Internet of Things solutions is driving new innovations and creating unimaginable opportunities which were just dreamt about before. The technology provides more visibility into the objects, and the operations, which gives more control in the hands of the customers. The smart home, car automation, intelligent security alarms, and smart offices are the best instances of it. The industries embracing IoT are looking at the use cases to make the devices view, listen and smell the data for real-time tracking and monitoring, that’s picking up the pace to predict and prevent disasters beforehand. The IoT services offer great value to the investment decisions and help businesses seize new opportunities with reduced total cost of operations. Moving forward, to enhance the potential of disruptive technology and improve the system responsiveness with real-time actions, the advancement in the IoT platforms, sensors, networks, and data analysis techniques is on. The voice search akin to Alexa and Siri personal assistants is changing the way people search and obtain the information. Now, translating the search string into a search query is no longer needed because the people can now communicate with the computer in their natural language without the need for a keyboard. At I/O conference, Google has announced that 20% of all the searches, which is nearly equivalent to 100 billion searches that are performed every day will have voice intent. The voice search growth will be accelerated as the Google home device make its way to the market. The investment in voice content indicates SEO-optimization of the websites or apps is not adequate anymore. For the Google indexation and make the content relevant to the local audience, the websites have to make the content voice-optimized along with SEO-optimization. To ascend the chances of showing up in a local voice search query, the businesses need to reinvent the SEO strategies that includes- completion of the Google My Business listing and add FAQs for each location. After smartphones, it’s the dawn of wearable app development. The smart glass, smart watch, smart belt, smart shoes and wristbands are some of the wearables that are standing on top of the user’s mind, more as a luxury instead of usability. Alike their popularity, their potential is not tapped to the fullest by the industries as anticipated initially. Though smartwatch and wristbands have found a good place in the health and fitness regime and fitness freaks are warmly embracing the gadgets as the most convenient way of tracking health and fitness-related activities. However, still, there exists a big room for the businesses to explore and revolutionize the individual lives adopting the wearable technology, no matter what industry they belong to. “The promising wearable market is expected to have 830 million wearable devices worldwide” as stated in a research. A technology used today is making the world a fast-paced arena and that, in turn, is fueling the rise of even better technology. Every industry and sector has been touched by the ever-changing trends of technology and transforming the every existence. In simple terms, technology has been changing the businesses very minutely and to stay in the business it is must change the trends.